How do I take photos with my iPhone? How much do you know about your photo taking practices and how much do you ignore? Can you learn a lesson or two from the hundreds of photos you take? 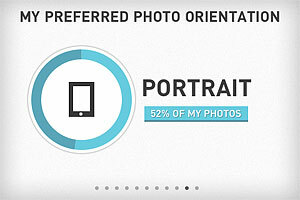 An answer to all these questions is offered by Photo Stats, the infographic creator for iPhone photos, available in the App Store for $0.99/€0.79/£0.69. Photo Stats gathers data from images stored in your device and uses the collected information to generate a summary in the form of clear and minimal eleven-part infographic charts. The charts will tell you everything, from your favorite photo locations to your most productive shooting days. 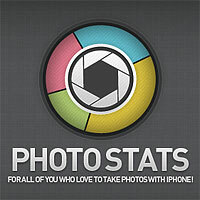 I have used Photo Stats to have an overview of my personal iPhone photography habits and a handful of relevant aspects appeared in my generated stats. Most photos miss metadata – The greatest majority of photos I have stored in my iPhone lack proper metadata. It results I have taken most photos in just a couple of locations. Not that I have been traveling a lot lately, but the list of places where I have taken photos stored in my Camera Roll is definitely longer than that. In some cases I intentionally turn off iPhone’s location services, especially to save battery, but what about the other cases? It’s not a big deal, really, as I know more or less where each photo was taken. Still, it may be a good idea to make sure metadata is intact. At any rate, it’s easier to strip photos of their metadata than adding or restoring it later. Most photos were taken in the evening – That is, most of my photos were taken between 6PM and 11PM. I know that in theory evening is one of the best times to shoot and that, after all, everybody has a favorite time of the day to take photos. In my case though this result is mostly indication of laziness. It is also indication my lifestyle is a bit “off”. It’s not a surprise, but the reminder is always quite shocking. After all, as they say, it’s the early bird that catches the worm. Almost 70% of images are “other” than photos – As I see it, this means that either I keep in my Camera Roll too many work-in-progress copies of my images or that I keep too many extra resources, like textures for instance. More likely, it’s both. Time to sort all these images out and to tidy my Camera Roll up! A lot of photos were taken using Camera – I can’t even remember using iPhone’s native camera app, at least recently. How did I end up with so many photos taken with it? I don’t know if this should be included in a list of bad habits, but more in general this means that I have a perception of my overall app usage that is not completely accurate. Photos show a good balance of portrait vs landscape orientation – Don’t I choose portrait orientation most of the times? Nope, it seems I am better than I thought at balancing the two. Just a little more than 50% of my photos are portrait-oriented. That’s good! 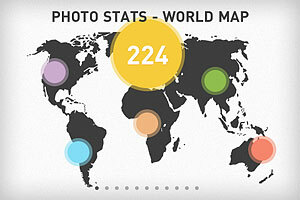 I am not sure I can brag and post my Photo Stats results everywhere. I am sure though that there are many things that I can do to improve and Photo Stats offered some useful hints by summing up briefly a few of my bad photographing habits — together with a few good habits I can work on further.